Nintendo’s E3 2018 booth is mostly full of increasingly-sweaty attendees playing Super Smash Bros. Ultimate, but it’s also home to a veritable museum of real-life custom props drawn from Smash, and therefore from the company’s rich history of games. Kotaku EIC Stephen Totilo is on the show floor, and couldn’t help but snap a bunch of photos of the coolest-looking props to show you all. Here’s what’s up, starting with that hammer up there. 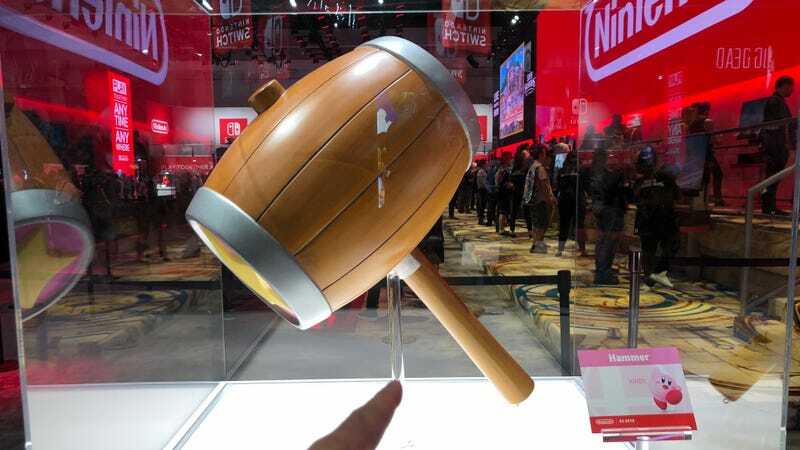 That’s not a Donkey Kong hammer, it’s a Kirby hammer! Quite different. The Splattershot, in real life. Here’s everyone’s favorite punching bag. Please nobody try to punch it. I was not really excited about any of these until I saw the Hogan’s Alley tin can, property of the Duck Hunt duo in Smash. Finally, here’s the god damned Monado, from Xenoblade. I hope Nintendo has tight security around all of these, is all I’m saying.